High infant mortality rates are a sign that pregnant women and newborns are not receiving adequate nutrition and medical care. Racial disparity in these rates shows inequity in access to care. Since good nutrition and medical care before birth and in the first year of life are crucial to healthy mental and physical development throughout our lives, this disparity can carry through far beyond infancy. 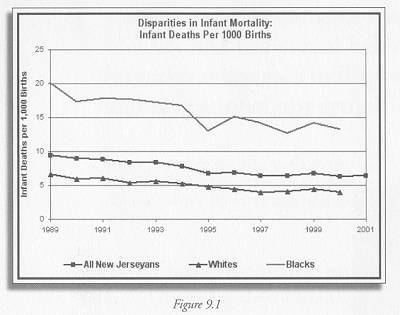 As Figure 9.1 shows, the infant mortality rate in New Jersey has been declining for more than a decade, from 9.4 deaths per thousand in 1989 to 6.4 in 2001. While we are doing better, the data suggest that additional efforts will be needed to achieve the state targets of 4.3 for all New Jerseyans and 6.4 for blacks by the 2010 deadline. Moreover, we are not reducing the racial discrepancies; a black infant in New Jersey is more than three times as likely to die before his or her first birthday than a white infant. These discrepancies are typically correlated with socio-economic status, poverty, substandard and overcrowded housing, poor nutrition, and reduced access to health services. Addressing other social inequities may, therefore, help in reducing the inequity in infant mortality rates. More information, at a minimum on cause of death, is needed to understand the best strategies for reducing racial disparity in prenatal care. Without that understanding, we may be unable to reduce the high infant mortality rates among black households. We would also like to have data that disaggregate infant mortality rates for Hispanics as well as for non-Hispanic whites and blacks. By 2010, reduce the infant mortality rates to 4.3 for all New Jerseyans and 6.4 for blacks.